Here is the big news of the week, and frankly, the best medical news of this journey so far: the pathology report says the cancer they removed from Emily was greater than 98% dead. As a review, the goal was 90%. If it was 90% or above, her long-term survival rate, medically, is 70%. If less than 90% of the cancer cells are dead, the survival rate is significantly less than 70%. So we’ve been praying for above 90%. The Lord has given us an answer that thrills us – greater than 98% of the cancer cells were dead. One of the early mysteries in this cancer journey to me was why they wouldn’t remove the cancer immediately upon discovery. Couldn’t it grow more? Couldn’t it spread? They said it was high-grade sarcoma, which has a tendency to do both (grow and spread quickly). The reason is this: they need to see the impact of the chosen chemo treatments on the cancer – otherwise the chemo treatments are guesses if they are working or not. And if cancer has spread to other places that we can’t yet see, they want to know the chemo is effective in killing it. So they did six weeks of chemo then removed the cancer to see if the current chemo regimen was being successful. If not – they would adjust the plan and try other meds. So Emily’s results were the best case scenario. The oncologist was very happy, and we are beyond thrilled. The other surprising news in Tuesday’s meeting with the oncologist was the next round of chemo starts today (Wednesday). In fact, if a bed had been available yesterday, they would have admitted her immediately. Sadly, often in the pediatric cancer center at MD Anderson, there are no available beds. It is a place of great fear, pain, and anxiety but also of hope – which is why so many come here. I really don’t know how people do it without the hope of Christ. The hope of MD Anderson is great. They are amazing, but it wouldn’t be enough for me. This is week 7 of 18 weeks of chemo. Of the 18 weeks of chemo, four of them are worse than the others. It is a combo drug of doxorubicin and cisplatin. Emily has faced two of them already and has two more to go. One of those starts today. Anemia which may cause tiredness, or may require blood transfusions – yes, we’ve had a few blood transfusions. Bruising, bleeding – not sure if we’ve seen this other than the bruising in her leg after surgery, but that’s to be expected. Kidney damage which may cause swelling and may require dialysis – Emily has been spared of this. Thank the Lord. Hearing loss including ringing in ears – No detectable hearing loss yet. They test her every couple of months. Hair loss – Emily’s hair has actually started to grow back in the time she’s been away from chemo (four or five weeks now). That will end this week. But she was glad to know her hair will grow back. Two nights in a row, she will receive the drugs (Wednesday & Thursday). Then they will run fluids through her for 48 more hours and then let her go home. So we anticipate being discharged on Sunday. So many of you have been praying. Thank you. Most importantly, can you thank the Lord with us for the results of the pathology report? Pray for Emily as she heads back into chemo. Her prayer request is that she wouldn’t throw up. She has done that a lot, but still hates it. She hates feeling nauseous but hates throwing up even more. Pray for Emily as she must continue with physical therapy this week. One of the things we were told a few weeks ago is that chemo is hard (we know that now), and rehab after surgery is hard (we know that too), but both of them at the same time feels impossible. So Emily is about to experience that. The physical therapists have said they will be up to see her and force her to put in some therapy. So pray for strength for Emily. Pray that Emily has the energy, strength and calm stomach to serve others in the hospital. It is what she longs to do but knows in the middle of feeling sick, it will be difficult. She wants to talk to children in the Pediatric Center to encourage them and help them know what is coming. Pray for Sue as she will be taking a weekend away. She doesn’t think she needs a break from 24/7 care of Emily, but we thought now is a good time for her to visit Morgan at college for a weekend. I know Sue is looking forward to being with Morgan at Liberty, but I also know it will be hard for her to fly out of Houston and leave Emily and me at the hospital (I know that from experience). So pray she has peace, can relax, and enjoy some time with Morgan. 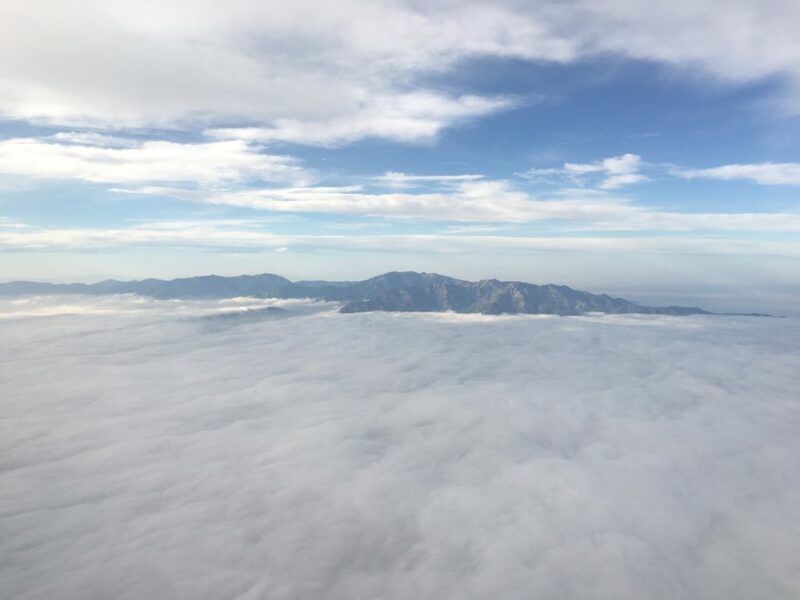 I was flying into LAX on Monday and had several minutes of awe at God’s creation as I looked out the window. I took this picture as we were descending into LA, and I was reminded that the God who created nature also made my little girl, and I’m so thankful none of this takes Him by surprise and that he loves her more than I ever could. Thanks for your prayers, friendship, and interest in Emily’s story. Woohooo! Thanking Jesus for Amazing results! 98%!!! Oh, David, we are so very grateful to God for this wonderful news! What a wonderful answer to everyone’s prayers. Please tell Emily that we are praying for her in this next round that God would strengthen her, comfort her, give her peace, and enable her through it all to be a blessing to those there at M.D. Anderson! We’re cheering her on in this chemo/rehab journey and know the Lord Jesus has her hand and will pick her up and carry her when needed. Love to you all. Praising God for the amazing oncology report! He is so awesome all of the time! Continued prayers for a full healing, but for immediate needs of strength, joy and witness to others. ❤️. Sue, prayers for your time away, rest in Him , knowing that He has Emily during this treatment time. Thankful for the pathology results!! we are praying here in Italy for Emily and your requests! Praising God and praying with you! Rejoicing with you & your fam, brother..while remaining stedfast in prayer! In Christ’s love! That’s a great encouragement that hopefully will propel her forward to the finish line. Thanks for keeping us in the loop David so we know how to pray! I’m with Nancy!!! Woohooooooo!!!!! Praise the Lord for His wonderful works to men (and women and teenagers!)! The answers are in His Hands, so we continue to pray here in SC! The LCC 1:11* Servant Prayer Team of over 80 people, including staff, elders, and volunteers, will be praying for Emily’s needs along with the needs of the whole family who love this beautiful lady, whose life is full of promise! Heavenly Father, thank You for Your enabling of Your creations to have wisdom in defeating the evil cancer from those who work with the chemotherapy to radiology to surgery! Please continue to open their minds to be able to fight this wretched disease with less side effects and with even more power so that this journey can be shortened and victories come much quicker! We give You all the praise for what has been done through these fearfully and wonderfully made people who have been called into the battle against these cancerous diseases! Enable those other seekers of cures or treatments on some of the “orphan” diseases from which fewer people suffer from, like TSC which a little girl we call Super Chloe has, creating benign tumors on her organs and affects her eyes! We know that disease entered our world along with the darkness of sin, but You ask us to pray, bringing our needs andmthose of people like Emily and Chloe to Your Throne for Your touch until the Day of Your Return to clean this earth and set up Your Kingdom! Until then, thank You for sending dedicated people into the battle against debilitating diseases for I ask these things in the Name of Jesus Christ, our Savior and Lord, Amen! I am so thrilled for you and Emily. Many folks at Low Country Community Church have been praying for Emily. We serve such an awesome loving God. He is the Alpha and Omega, our Healer, our Redeemer, and the lover of our souls. Praising God with you! Praise the Lord & continue to pray. Thank you for sharing The journey you are all taking. YEAH! *wipes away tears of joy* Don’t know where those tears came from. The onion ninjas must be sneaking around again. ;D I was praying all the pathologists would find was a field of dead, obliterated cancer cells, and the percentage would be way above 90%, preferably 100%. I will definitely be dancing my Dance of Great Praise for 98%. SO THRILLED! I am so, so, so, so, SO THRILLED for Emily! I know, for a few reasons, how nasty sarcomas are and how they can spread. For her sake, first and foremost, I’m overjoyed the chemo obliterated the tumor and there has been clear success. I know this has to be a weight off her. I’m thrilled and overjoyed for you, Sue, Ali, and Morgan, knowing Emily’s treatment has been so successful. The four of you have been in my prayers right along with Emily. I’ve been praying God would give Emily the strength to handle chemo and PT at the same time. What a double whammy! Talk about something someone will need a Divine strength infusion for. With God, all things are possible. Emily, as always, is in my prayers, and so is everyone around her. So glad to hear such great news! Our family prays for Emily each night. Praying and thanking God every hurdle over is a victory! I could not be an more thankful, for all of the blessings our GOD, has brought to your family. I can thank GOD for many things. He gave me the opportunity to met your beautiful daughter, for giving me the ability to see your blog and especially to read that GOD answered our prayers, for more than 90%. As my boss had mentioned in a previous comment, we have all been following your blog and praying hard for your family. It’s not often we get the chance to follow the journey of a patient, once they leave the office. I cried tears of joy when I discovered you are a man of faith. It gave me great comfort to know your family had more than prayers on your side but God himself with you through it all. I just wanted to take the time, to remind you that we’re all still sending up prayers for all of you. We’re looking forward to the day when you all may be able to come visit us with your healthy, happy daughter. Thanks so much! We so much appreciate Dr. Chimenti and your entire team! We will have to bring Emily by to say “hello” when this is all over.